Prices quoted are based on a standard 4 seater vehicle. This can vary if you require a multi-seater vehicle or are travelling over the Christmas and New Year Period. The return journey includes up to 1hr waiting and parking. Any waiting or parking thereafter will be charged to the customer. We aim to arrive 20-30 minutes after landing/arrival. Waiting is £10 per hour / £2.50 per 15 mins. £130 – £140. If parking is required then this will be plus parking. Waiting is £10 per hour / £2.50 per 15 mins. The prices below are a guide of what you can expect to pay on the meter. This can vary depending on traffic conditions and time of day as the rate does change between 11pm and 7am. 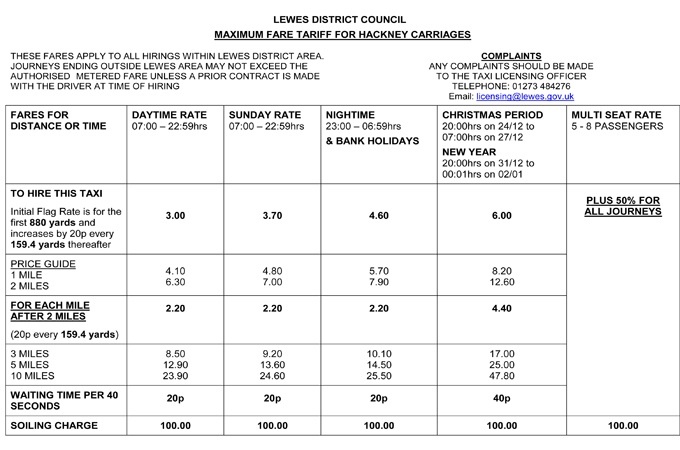 Please do refer to the Lewes District tariff guide at the bottom of this page. If you would like a set price then do contact us by eMail in advance of travel.